Objectives The main aim of this study was to compare two days of continuous monitored capillary blood glucose (CGM) responses to sitting and standing in normally desk-based workers. Design, setting and participants This open repeated-measures study took place in a real office environment, during normal working hours and subsequent CGM overnight measures in 10 participants aged 21–61 years (8 female). Main outcomes Postprandial (lunch) measures of: CGM, accelerometer movement counts (MC) heart rate, energy expenditure (EE) and overnight CGM following one afternoon of normal sitting work compared with one afternoon of the same work performed at a standing desk. Results Area-under-the-curve analysis revealed an attenuated blood glucose excursion by 43% (p=0.022) following 185 min of standing (143, 95% CI 5.09 to 281.46 mmol/L min) compared to sitting work (326; 95% CI 228 to 425 mmol/L min). Compared to sitting, EE during an afternoon of standing work was 174 kcals greater (0.83 kcals/min; p=0.028). The accelerometer MC showed no differences between the afternoons of seated versus standing work; reported differences were thus a function of the standing work and not from additional physical movements around the office. Conclusions This is the first known ‘office-based’ study to provide CGM measures that add some of the needed mechanistic information to the existing evidence-base on why avoiding sedentary behaviour at work could lead to a reduced risk of cardiometabolic diseases. Sedentary behaviour (eg, sitting for prolonged periods), independent of physical activity levels, is associated with significant risk of diabetes and cardiovascular disease. The physiological mechanisms of this association have not yet been fully elucidated, and this study aims to provide some new insights into such possible mechanisms. 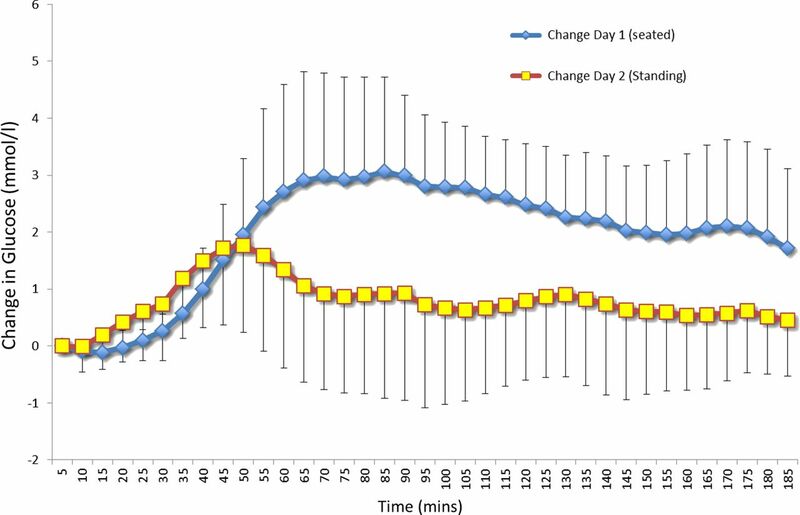 These results, collected in a ‘real workplace’ from a group of office workers who wore continuous blood glucose monitors for two days, showed postprandial glycaemic excursions being significantly attenuated by 43% during standing compared with seated deskwork. Along with attenuated postprandial blood glucose excursions, the energy expenditure during standing deskwork was 0.83 kcals/min greater than performing the same work while sitting. These results provide some preliminary evidence of possible physiological mechanisms in the attempt to explain the epidemiologically reported associations between sedentary behaviour and raised cardio-metabolic disease risk. Evidence for the association between sedentary behaviour in domestic and occupational settings and cardio-metabolic diseases is mounting, and these are independent of physical activity and exercise participation.1 ,2 Most of the current evidence is epidemiological, with a growing number of prospective or interventional behavioural analyses,2–4 but with few studies assessing daily cardio-metabolic changes and related physiological mechanisms. In relation to occupational environments, experimental studies to date have mainly focused on differences in energy expenditure and/or the influence that standing at work has on triggering increased levels of spontaneous or non-exercise activity.5 The use of ‘treadmill desks’ has been one popular intervention,6 but part of this benefit includes the potential contribution to cardio-metabolic changes from simply standing up more. Hypotheses of the physiological mechanisms to standing more during office-type work include the small but frequent and long-term beneficial changes to blood lipids, blood glucose and insulin, which have resulted from breaking sitting-based work by standing, especially in a postprandial state.7 To date, no study has assessed the effects of standing versus seated desk work in a real office environment while measuring the continual flux of blood glucose. The aim of this study was, therefore, to assess the acute effects of standing-based office work on blood glucose and related energy expenditure. A small city-centre property agent's office volunteered for the study. All measures were completed over 6 days of the same week. Ethical approval for the study was granted by The University of Chester's Faculty of Applied Sciences Ethics Committee (application no. 779/13/JB/CSN). Exclusion criteria included: participants’ knowledge of having diabetes or being currently investigated for cardio-metabolic disease, known pregnancy, any significant pulmonary or cardiovascular condition that would be exacerbated from standing for prolonged periods, or any neurological or musculoskeletal condition which would be exacerbated by working standing-up. Following informed consent, participants were asked to keep a detailed record of the items of food consumed that evening and the next morning before the study commenced. For the following 64 h, participants were then asked to eat the exact same food (volume, type and time of day, including snacks and drinks) and refrain from alcohol consumption and moderate-to-vigorous exercise/sport. This included the provision of the same standardised buffet lunch on the two recurring working days of the ‘at desk’ tests. Continuous blood glucose monitor system (capillary blood glucose (CGM); Dexcom G4, San Diego, USA; 14% intradevice sensitivity, 8% interdevice sensitivity, and 15.8% to 13.4% specificity for blood glucose at 3.4–10.0 mmol/L, respectively). Waist-band accelerometer (MyWellness Key, Technogym, Bologna, Italy; intradevice reliability for low-intensity movement counts, >99%; intraclass correlation at any intensity >0.93). Wireless chest-strap heart rate monitor system (Timex Personal Trainer, Middlebury, Connecticut, USA; validity error <5 beats/min). In first assessing data for normality, paired t tests were then applied to compare postprandial sitting and standing work responses from the end of lunch until end of working day for: total accelerometer counts and areas under the curve (trapezoidal method) for blood glucose excursion, heart rate and energy expenditure. Statistical significance was set at p<0.05. Posthoc power calculations were performed to estimate sample sizes for future studies. Ten participants agreed to participate; eight women (22–59 years; 45–82 kg) and two men (21 and 62 years; 80 and 110 kg). All had a Body Mass Index <30. Preprandial (lunch) blood glucose levels on the sitting and standing days ranged between 3.3 and 6.0 mmol/L/min, and 4.3 and 7.1 mmol/L/min, respectively. The intraindividual differences in these daily baseline pre-prandial levels were all less than the CGM's 15% error of sensitivity. The postprandial (lunch +185 min) area-under-the-curve analysis (figure 1) showed a 43% lower excursion (p=0.022) of blood glucose for standing (143, 95% CI 5.09 to 281.46 mmol/L/min) compared to seated desk-work (326, 95% CI 228 to 425 mmol/L/min). From lunch, mean blood glucose continued to rise during seated work for 85 min by 3.1 mmol/L, whereas for standing work, it peaked at 50 min to 1.8 mmol/L. At the end of the working day, mean blood glucose from seated work had decreased to its lowest level at 1.7 mmol/L above baseline, whereas for standing work at the same time point, it was 0.5 mmol/L above base line. Mean overnight (19:00–07:00 h) blood glucose values after seated and standing work were not different at 6.3 (±1.0) mmol/L and 6.2 (±0.8) mmol/L, respectively. The variability of the overnight blood glucose measures (SDs), demonstrated a trend of being lower by 0.2 mmol/L after the standing versus the sitting work day, but this did not reach statistical significance (n=9; p=0.052). The posthoc power calculation for these 10 participants was 75%, with an estimate of 15 participants required for future studies to achieve >90% power. Change in blood glucose, following a standard buffet lunch, while working predominantly for 185 min in a seated or standing position. Access the article online to view this figure in colour. Total mean energy expenditure for the afternoon (area under the curve for 210 min) was 174±66 kcals greater (p=0.028) in standing (487±174 kcals) versus seated work (313±139 kcals). In light of growing evidence for the cardio-metabolic health risks of sedentary behaviour,1 these results provide an important initial hint at a possible mechanism as to why the avoidance of sitting down is beneficial.10 Greater amplitudes of glucose variability have been linked to circulatory oxidative stress,11 and figure 1 demonstrates the potential effect that standing-based work can have on reducing postprandial glycaemic variability. The greater peak glucose amplitude during seated work (3.1 mmol/L) compared with standing (1.7 mmol/L), is of clinical significance, where such heightened amplitudes have been strongly associated with oxidative stress.12 Furthermore, the peak rise in glucose following standing compared with seated work occurred 35 min earlier and remained lower throughout the afternoon by 1.4–1.7 mmol/L. The limited sample size of this study needs to be respected in currently making any generalisations and the potential in making a Type 1 error. Posthoc analysis to achieve good statistical power (>90%) has now been estimated with finding similar results in at least 15 new participants. The current study sample size was necessitated by the financial implications of accurate field-based monitoring (∼£2000 per CGM monitor, ∼£150 per CGM disposable microcatheter telemetry device, £600 per standing desk). In a small group of desk-based office workers who changed to a standing work position using an ergonomically adjustable desk, postprandial glycaemic excursions were attenuated. There was a corresponding small but significant increase in daily energy expenditure. These results provide an initial insight into a possible key physiological mechanism (improved glycaemic regulation), of why avoiding sedentary behaviour at work could benefit cardio-metabolic health. It provides a strong rationale for us and others to now seek more substantive funding to further elucidate the cardio-metabolic effects of standing-based office work. The research team would like to thank: Rebecca Matthew and staff for allowing us to intrude their office for a week, and their very willing attitude towards participation in the study; Jayne Dodgson and Gemma Sproston for coordinating the practicalities of the study between the University of Chester and local businesses; Susan Edwards and HoYee Cheung, specialist diabetes nurses from the Countess of Chester Hospital.
. Sedentary time in adults and the association with diabetes, cardiovascular disease and death: systematic review and meta-analysis. Diabetologia 2012;55:2895–905.
. Acute sedentary behaviour and markers of cardiometabolic risk: a systematic review of intervention studies. J Nutr Metab 2012;2012:712435.
. Sedentary behavior, physical activity, and markers of health in older adults. Med Sci Sports Exerc 2013;45:1493–500.
. Continued sedentariness, change in sitting time, and mortality in older adults. Med Sci Sports Exerc 2013;45:1501–7.
. Energy expenditure of nonexercise activity. Am J Clin Nutr 2000;72:1451–4.
. Treadmill desks: a 1-year prospective trial. Obesity 2013;21:705–11.
. Breaking prolonged sitting reduces postprandial glycemia in healthy, normal-weight adults: a randomized crossover trial. Am J Clin Nutr 2013;98:358–66. Pescatello LS, Arena R, Riebe D, et al. (Eds). ACSM's Guidelines for exercise testing and prescription. Baltimore: Lippincott, Williams and Wilkins, 2013.
. Energy expenditure comparison: a pilot study of standing instead of sitting at work for obesity prevention. Prev Med 2011;52:283–4.
. Impact of postprandial glycaemia on health and prevention of disease. Obesity Rev 2012;13:923–84.
. Glucose variability. Diabetes 2013;62:1398–404.
. Glycemic variability: clinical implications. Indian J Endocrinol Metab 2013;17:611–19. Contributors All authors have contributed equally to the concept, design, analysis and appraisal of the data, with the lead author having synthesised the manuscript with the full agreement of all authors that the submitted document meets with their individual and collective agreement. Ethics approval University of Chester Faculty of Applied Sciences Ethics Committee.